As a system administrator, I need a lot of real estate on my desktop to be able to do multitasking and accomplish things in parallel. In the *nix environment this doesn't cause issues as there are virtual desktops readily available. This is true regardless of whether you are on the command-line or the graphical user interface (GUI). Even on the text-mode interface, Linux has virtual terminals still making it possible to do multiple tasks at once. 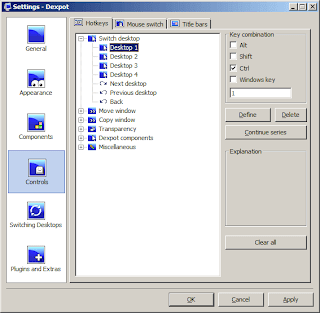 However, most sysads nowadays use Windows and just open terminal connections to the remote server. There are no virtual desktops on the Windows environment. And often, given the mobility preference, screen size is limited. This is where virtual desktops play a big factor. Where this functionality is absent, dexpot comes to fill the gap. You can have up to 20 multiple virtual desktops, if you require that many. This is an easy way of increasing work area without having to shell out. 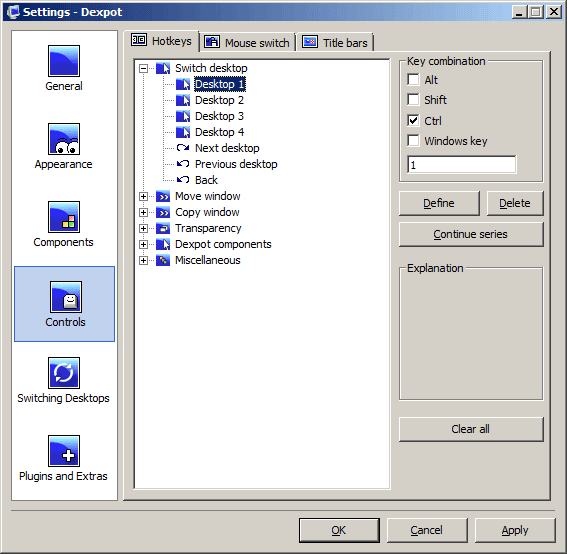 What's more, switching to another desktop is easy as this functionality is supplied via hotkey. For ease-of-use, this is how I configure dexpot. For hotkeys, I assign [CTRL]+ ... [CTRL]+ for desktop switching. You can customize the same for your own taste. Then I also let the Desktop Manager run with dexpot. I place the icons near the system tray so that I could either use hotkeys to switch desktops or click on the Desktop Manager icons. Below is how it looks. For some reason, the developers assigned German as the default language of dexpot. It is quite difficult to change the language settings on the application interface if you don't understand German. The fastest way to get around this configuration is to explore the directory sprache (under the dexpot directory). In this directory you will find language files. Delete everything except english.dxs (or move them to another folder if you wish). This will make dexpot run in English and is the easiest way to get this configuration done with less effort. Even with a small screen on my Dell Latitude D630 notebook, dexpot has given me a lot of real estate with the virtual desktop functionality. You might find this useful too.